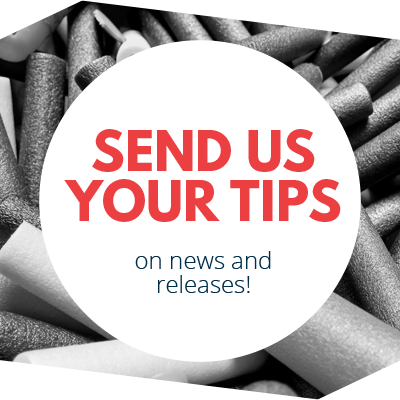 The Nerf Maverick REV-6 is one of the most popular Nerf blasters of all-time, and for good reason. The Maverick is easy to load, easy to carry, easy to modify, never jams, and looks great. It’s one of the few, original, N-Strike series blasters you can still find in stores today right alongside newer Elite series products. Clearly, sales of the Maverick have been high enough to prevent Hasbro from ceasing their manufacture, even though they would clearly like to move buyers into the Elite line (along with Elite darts). So, what’s Hasbro to do? Create an Elite version of the Maverick, of course! Enter the N-Strike Elite Strongarm. Only about an inch longer than the Maverick, and bearing a similar barrel-heavy, steampunk-style appearance (color scheme notwithstanding), the novice could easily be forgiven for assuming the Maverick and Strongarm are basically the same blaster. However, there are a few significant differences. 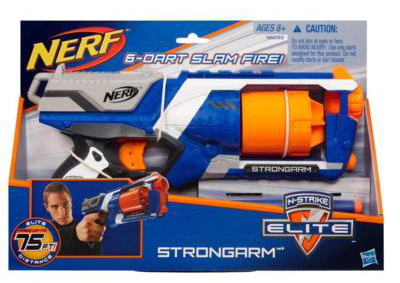 For starters, the Strongarm can slam fire (hold the trigger and keep priming)—in fact, it’s currently the only Elite series blaster to slam fire with a rotating barrel. In addition, the Strongarm can fire darts that are clip-system compatible, whereas the Maverick was incapable of firing slimline darts of the previous generation. And interestingly enough, the Strongarm barrel spins when the plunger returns, not when the trigger is pulled—so, unlike the Maverick, the barrel can’t be fully loaded unless it is dropped. Perhaps to make up for that, the Strongarm’s dart access is improved via a more open chamber and a lower barrel drop (a modification frequently made to the Maverick). And, of course, being part of the Elite series, the Strongarm’s stock ranges far exceed the Maverick, with measured distances of up to 49 feet with zero incline, and up to 66 feet (62 feet, average) with 30 degrees of inclination. Jamming was negligible, though accuracy was a little worse than average, with shot trajectories that varied widely from one dart to the next. The biggest weakness of the Strongarm is that it will forever be compared to the Maverick. *Image is property of NERF®. All-in-all, then, it would appear as though the improvements made to the Strongarm (slam fire, barrel access, Elite clip system dart usage and range) would make it a worthy successor to the Maverick. And perhaps if you’ve never used a Marverick, that would be a fair assessment. But if you’ve used a Marverick regularly in the past, you may find the Strongarm to be a bit of a disappointment. The problem seems to be the slight growth in size and weight of the Strongarm versus the Maverick. 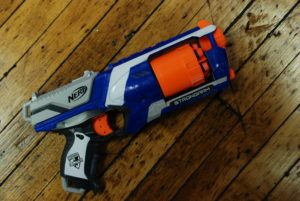 The Strongarm is simply a larger blaster, and it feels like it. There’s less of a nimbleness, less of a pick-up-and-go feeling that the Maverick always had… the extra inch or so in length really makes it feel nose-heavy, and a bit unwieldy. There’s also less joy to be had in using Elite darts versus the suction-cup ones the Maverick used—the feeling of a dart “sticking” to a wall or TV screen or virtually any other flat surface just can’t be made up for by the bounce of a skinny Elite dart. And there’s an elusive tactile quality that somehow just felt more “right” with the Maverick. In fairness, the Strongarm is not a bad blaster. It retains a lot of the Maverick strong points while attempting to improve on some of the latter’s weaknesses. It also shoots pretty far (though with worse accuracy than we recall with various Mavericks we’ve used), and can be used in slam fire mode to improve upon the Maverick’s relatively slow rate of fire. And it’s on the reasonably affordable end of the Elite line pricing. Unfortunately, the biggest weakness of the Strongarm is that it will forever be compared to the Maverick. Indeed, if range isn’t an issue, we’d be hard-pressed to recommend the newer Strongarm if given a choice between the two… instinctively, we’d grab the blaster that’s more comfortable and more fun to use. And 9 times out of 10, that would be the Maverick. Sometimes it’s hard to improve on a classic. 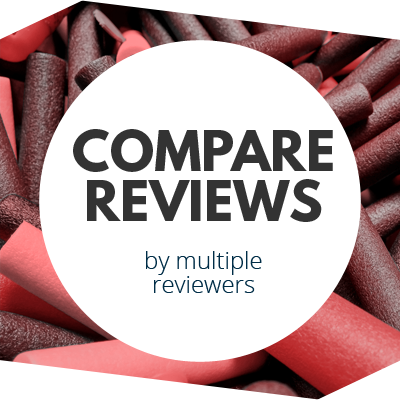 This entry was posted in Dart Blasters, Reviews and tagged blaster, elite, n-strike, nerf, review, strongarm on December 24, 2013 by PMindemann. Wow. Even the “Elitified” version can’t kill off the original. I have both and actually prefer the maverick for the points above.